While the majority of the water on Earth is found in the ocean and other bodies of water, there is still 12,900 cubic kilometers (3,095 cubic miles) located in the atmosphere. Water in general has an association with nothingness, as a clear liquid that will not stain clothing and is offered free at restaurants. As the way we perceive it, water really does not have substance. Many people also pair this connection with clear odorless gases, which can occasionally be hazardous. We are often unaware of these things, even if they are directly in our presence. While water vapor generally cannot harm humans, since it is just water in a different state of matter, it can be problematic for many materials used for different purposes. Detection of water vapor in some porous materials is covered by ASTM E96/E96M-16 – Standard Test Methods for Water Vapor Transmission of Materials. ASTM E96/E96M-16 describes two test methods that determine the water vapor transmission of materials through which the passage of water vapor could damage the material or be of some importance. For example, these tests can help to understand the increased humidity in a heated dry building during a rainstorm. The processes identified in this standard test many different kinds of materials, including paper, plastic films, other sheet materials, fiberboards, gypsum and plaster products, wood products, and plastics. The two basic methods are the Desiccant Method and the Water Method, both of which are limited to specimens under 32 mm (1.25 in) in thickness. In the Desiccant Method, the test specimen, which can be any one of the materials covered by the scope of the standard, is sealed to the open mouth of the test dish containing a desiccant, and the assembly is placed in a controlled atmosphere with a set temperature and humidity. 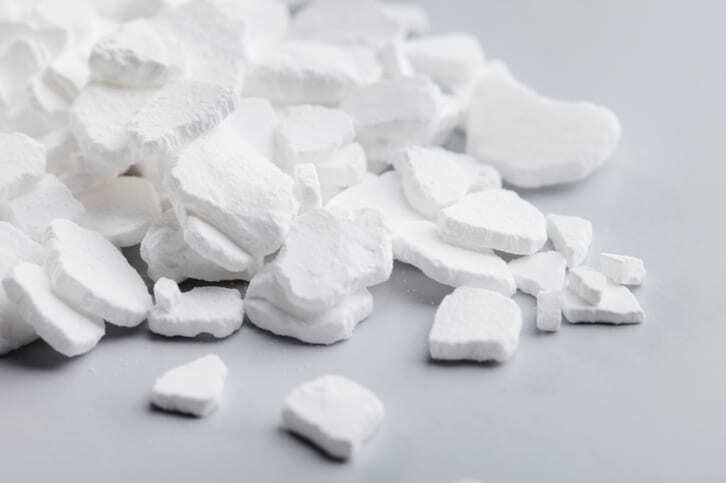 The desiccant used must be anhydrous calcium chloride in the form of small lumps that have been dried at 200°C (400°F). For some time after this assembly is constructed, periodic weighings of the desiccant will determine the rate of water vapor from the air that travels through the specimen into the desiccant. Calcium Chloride is used as the desiccant. In the Water Method, a test dish is simply filled with water and placed 19 mm (0.75 in) from the specimen, with a margin of error of 6 mm (0.25 in). The test dish used in both the Water Method and the Desiccant Method should be as large as practical, at least 3000 sq mm (4.65 sq in). The weighings in the Water Method determine the rate of vapor movement into the sample from the water in the controlled atmosphere. This method creates an environment with much more humidity than that of the Desiccant Method. ASTM E96/E96M-16 specifies many guidelines for all of the different materials and processes needed for these two methods. It also provides the calculations needed to comprehend the data generated from the Desiccant Method and the Water Method. The values generated from the procedures have applications in design, manufacture, and marketing. Completion of either one of these methods should result in a test report, which compiles information on the test method used and the temperature and humidity of the test chamber.